Blog / Announcements / From our Desk / Version 2.0 – Available now! Version 2.0 – Available now! Before introducing this new version, we’d like to thank all our supporters and customers for their overall involvement in PHP Melody’s progress. Today marks an important milestone in PHP Melody’s development. PHP Melody is growing faster than ever, even 5 and a half years since its first version. Usually, each new update focuses on a fixed set of features or product area. We’ve taken the time to make sure that v2.0 is a general improvement and not just the customary collection of new features. That’s why you may notice improvements from the small things to the large ones. A lot of customers have requested that we bring back the artists field which was dropped in v1.7. We’re happy to reveal that we went a step further and introduced ‘custom fields’ in v2.0. This feature alone extends PHP Melody’s abilities to an entire new level. Fields such as the ‘artist’ field, ‘seasons’ or ‘episodes’ can all be defined and used quite easily. The ‘custom fields‘ is just one of the new features that comes with v2.0. * New video uploading procedure with an upload progress bar. * Built-in floating sharing widget (Facebook, Twitter & Google) for videos, articles and pages (optional). * RSS links for listing pages in the footer. * New visualization plugin for mp3 files. * Video resizing button, which expands the video player to the entire width of the page. * ‘Delete’ button on each video page, next to the existing ‘Edit’ button. * Included more details about video and article author with an additional option to follow the author. * Edit the ‘404 Error’ and ‘Terms of Agreement’ pages right from the built-in ‘Page Manager’. * Option to choose which of the pages should appear in the header menu, or not. * Built-in JW Player 6 license code field on the ‘Settings’ page. * Updated listing pages for videos, articles, pages, etc. * Easily create new categories, without leaving the editing/submission pages (videos and articles). * Easy to re-upload and/or download locally hosted videos without leaving the video editing page. * Easily replace/upload video thumbnails without leaving the editing pages. * New option to manually approve new user registrations. Allows you to create a closed community. * New option to disable comments on any videos or articles. * New option to auto-approve any uploaded/suggested video, without any moderation (use with caution). * ‘Custom Fields’ which allow you to define meta data for each video or article. 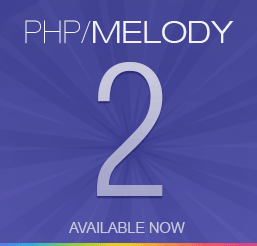 * JW Player 6 was taken out of the ‘experimental’ stage and it has been fully integrated into PHP Melody v2.0. * Totally revamped video embed codes, which now include the option to show pre-roll ads. * Video listings can now be sorted alphabetically in addition to date, views and rating. * Video uploads will auto-complete the ‘title’ with the uploaded file name. * Updated JW Player 6, as well as some 3rd party scripts. * Revamped listing pages for videos, articles, pages, etc. (Admin Area). * The default theme was improved in more ways than one. Better styling and fewer HTTP requests. * Admin area improvements in loading speed and across multiple screen resolution. * All premium themes have also been improved with certain browser-specific issues fixed. * Mac OS color fix: The gray color way too light and unreadable. * Header drop-down was showing sub-sub-sub categories without mouse over. * Video listing issues on certain pages; especially when used with non-English languages. * ‘My favorites’ listings alignment issue (in Chrome). * Thumbnail flickering issue on mouse over (in Chrome). * Long video descriptions were cut off. * Sharing of videos on Facebook prompted an empty player with the wrong thumbnail. * Registration form validation issues. * Registration did not accept non-Latin usernames. * Generated embed codes contained the wrong width and height. * MP3 player font color. * Fixed cases where the meta_description was empty. * Top videos appear empty for a long time after the installation because the default sorting is by ‘rating’. * Avatar upload page shows the old avatar after update. * Admin status was updated each time a pending comment was approved. * Activity stream fix for grouping similar activities. * Double login into the admin area (on certain browsers). * Issues with Admin Area login (the login form would not appear in IE8). * YouTube user import from usernames containing Cyrillic characters. * URLs containing IP addresses (not hostnames) are recognized as local URLs. * The ‘HTML counter’ text area saved unwanted characters. * Editing a video stream ‘breaks’ the listing. * Category editing changes the category position and messes other categories. * Database export/backup saves *.sql files compatible with MySQL 5. As you see, this is the biggest improvement of the year (so far). Thank you again and enjoy PHP Melody v2.0. I’ve been waiting for this release with the custom fields for artist (I have a music video site). How do I migrate from version 1.67 to version 2.0 and retain the artist field? I don’t want to have to repopulate over 3K worth of videos by hand. I’m licensed customer, where can I downloaded the older version 2.0. You can email customer support and request it.